John Newton wrote the words to this hymn in the 18th century. Newton was the reformed master of a slave ship and not a particularly pleasant character in his earlier life. He became rector of a parish in Olney in Great Britain, where he compiled "Olney Hymns," a hymnal which was published in 1779 and contained the first printing of "Amazing Grace". The original tune used to accompany "Amazing Grace" is associated with the Scottish folk song "Loch Lomond" and the17th century English hymn "Todlen Hame". The "New Britain" tune -- the tune now most associated with the song and the one used by Elvis -- was first used in 1835 in the hymnal "The Southern Harmony" in the USA. Elvis sings an extra verse, not included in Newton's version ("When we've been there ten thousand years…"); this verse was added by John Rees in the 19th century. 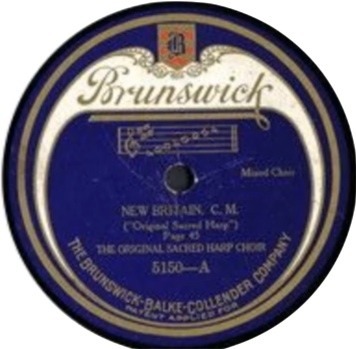 The Original Sacred Harp Choir's recording was released on Brunswick 5150 with the title "New Britain".